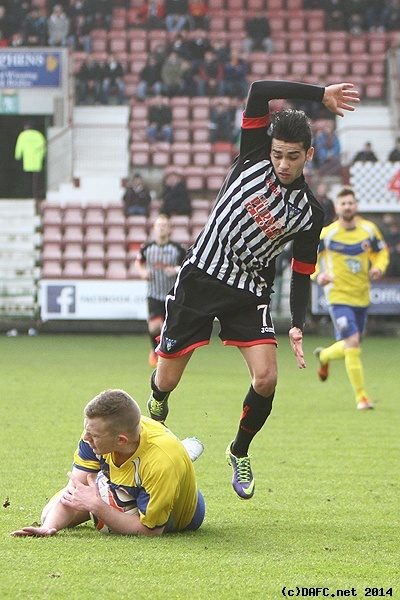 Twice the Pars conceded bad goals, twice they fought back to equalise. However, Thomson’s header and Husband’s second penalty in two games counted for naught as Accies were allowed to score a simple third and claim all 3 points. Josh Falkingham v John Routledge. It’s the start of a new fiscal year. Whether this represents a new financial beginning for the Pars depends on many factors, not least the attitude of their support. A lot of effort had gone into persuading lapsed and part-time supporters to turn up and in the end there was a decent attendance, with kick-off being delayed by a couple of minutes to allow late-comers to take their places. It was a big day in the SPL too, but despite that there were a handful of fans from other teams – including Hearts, Hibs and Dundee Utd – lending their support, as well as some familiar former players such as Ian Westwater, all contributing to the cause. 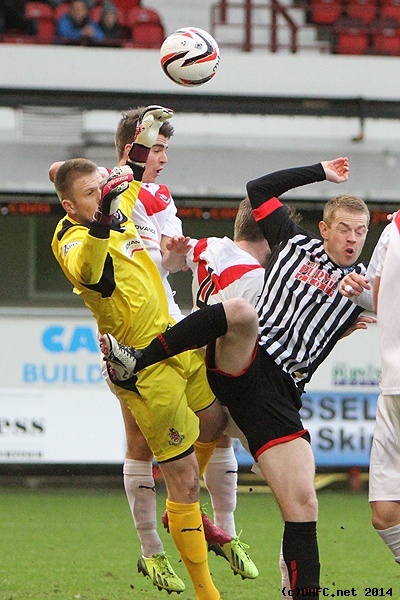 Shaun Byrne v Ziggy Gordon. As for team matters, not only did Jim Jefferies have a denuded squad following the wielding of the Administrator’s axe, but he had injury problems as well – Ryan Wallace was out for a month, Craig Dargo was also absent, and John Potter was a pre-match doubt after limping off last Saturday. There was better news with Andy Geggan and Callum Morris being passed fit and both would start. Otherwise, he had to go with a team packed full of youngsters, albeit those who had fought back so well at Livi, and one which, due to the boss’s willingness to give youngsters some game time, had accumulated a fair number of appearances. So it was Hrivnak in goal, a back four of Millen, Young, Morris and Whittle, four in midfield (Byrne, Geggan, Husband and Falkingham) and an untried front due of Smith (on his first start) and Thomson. John Potter made it as far as the bench, along with the relatively experienced (11 appearances) Chris Kane, Fayssal El Bakhtaoui, young striker Blair Henderson and Ryan Goodfellow. In contrast, Hamilton had an experienced side, but a new coach, Alex Neil temporarily filling Billy Reid’s shoes, following the departure of the man who had been the longest serving manager in Scottish senior football. He adopted a slightly more aggressive line up than is the norm for visiting teams, perhaps looking to take advantage of the Pars’ inexperience or their abysmal home form, with Jon McShane partnering Stevie May in a 4-4-2. Neil dropped himself to the bench, with Grant Gillespie taking over the holding role in midfield. Pars Administrators take in the game. The Pars kicked off and within 13 seconds Ryan Thomson was penalised for fouling as he tried to get on the end of a long ball. Accies came forward, and Morris sliced an attempted clearance in the direction of the corner flag to concede the first corner of the game. That too was cleared behind; from the second attempt McShane was allowed to head home from close range by a static defence. 1-0 Accies and precisely the start that wasn’t wanted. This looked ominous, but the Pars managed to keep the ball away from their goal for the next 10 minutes or so, without looking remotely threatening themselves. Slowly they began to come into the game – Husband put in a free-kick in 13 minutes that went all the way through to keeper Cuthbert and two minutes later they created a genuine chance of sorts with Smith teeing Falkingham up at the edge of the “D”, but Josh’s effort curled over. Thomson was slowly getting to grips with his new role as striker as the Pars were making full use of him as their out ball. 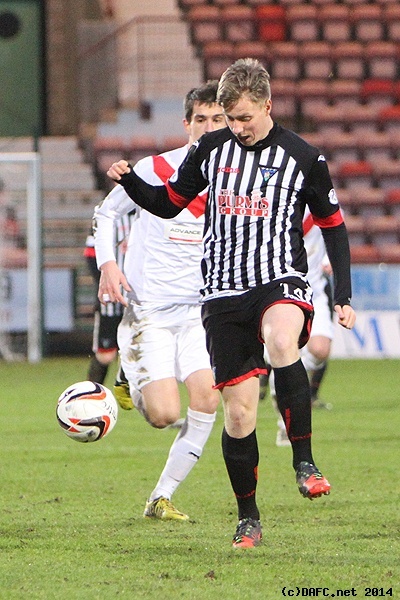 In 20 minutes he showed good control and combined with Whittle to win the Pars first corner, on the left. Millen appears to be responsible for almost all dead ball deliveries that won’t involve a direct shot, and having hit the bar twice last week, he nearly did the same from the quadrant, his inswinging effort landing on the roof of the net. Jefferies had made an early tactical switch, rotating Byrne to the left and moving Husband over to the right, and Shaun’s quick feet won him a free-kick at the corner of the box, but Husband dragged his effort wide. Thomson chested down to let Falkingham dig out a shot 3 minutes later, although Cuthbert was untroubled, before the Pars suffered a pair of set-backs just before the break. Firstly Geggan was booked for persistent fouling, despite the incident being only his second transgression of the game. If this might have hamstrung his competitiveness, the point became irrelevant when he was tripped by MacKinnon and suffered an ankle injury that meant he could take no further part in the match, Kane being his replacement.